Page Updated:- Wednesday, 13 February, 2019. Maple Road, Dartford c.1900. Crowley's Fine Ales - This was a Croydon brewery. There is a Maple Road in Dartford, quite a long one but no indication of there ever having been any pubs on it. In itself that's surprising. A handwritten note on the back of the card says Kent - Dartford. I wonder if it's not Dartford but Deptford, or somewhere else entirely. Perhaps unsurprisingly, the card was published in Croydon. 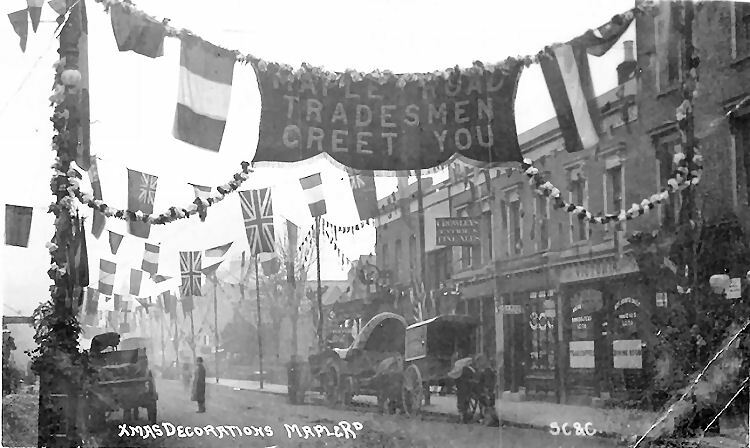 There's also a Maple Road near Croydon, in Penge, which has a pub called the "Maple Tree" but I'm pretty certain this isn't the one on this picture.